Duelling Paintbrushes 2: Day 27. 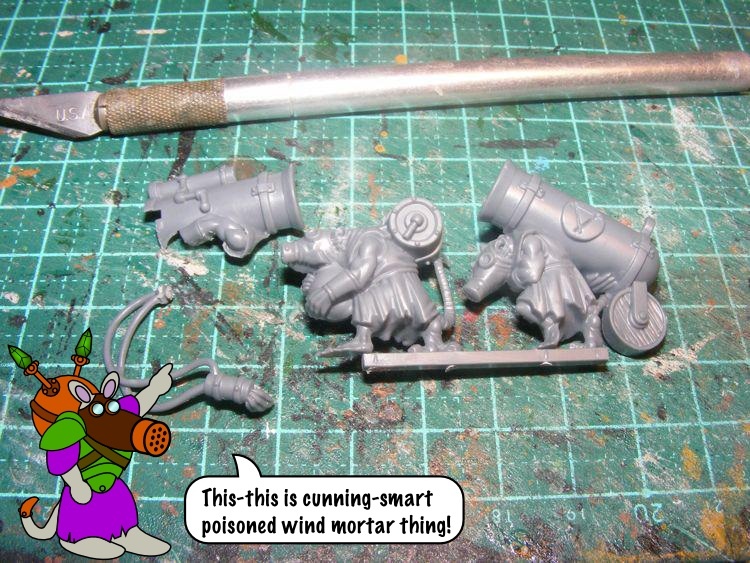 Some more work on clan rats, attached the last rat ogre's head... and built a Warpstorm Accumulator. "A what?" you cry. 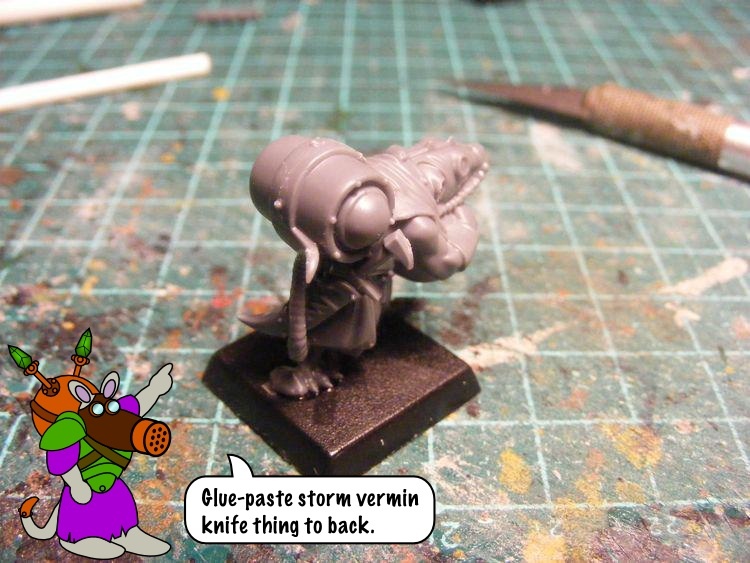 Well, it's a unit filler for my Storm Vermin, taking up the same space as six skaven. 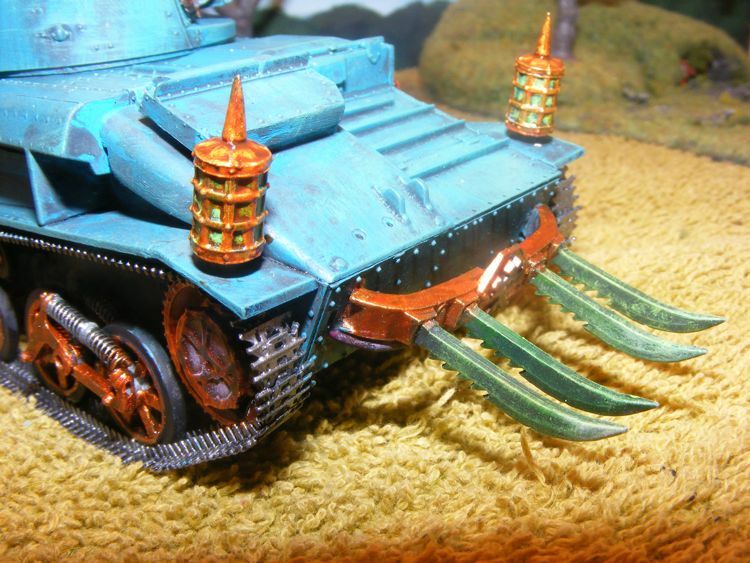 The tracks, exhausts and pillar-thing are from Technolog Robogear kits - mostly the Hurricane tank, but the exhausts are from the Spider. The models themselves look goofy, but they have plenty of good parts! In position in the Storm Vermin. I don't have a base yet, but I have measured and checked it's the right size. Plenty of bass guitar strings, a doll's eye fastner and a ball from a christmas decoration (I think) complete the insane contraption. Duelling Paintbrushes 2: Day 26. Anyway, it can now become clear. 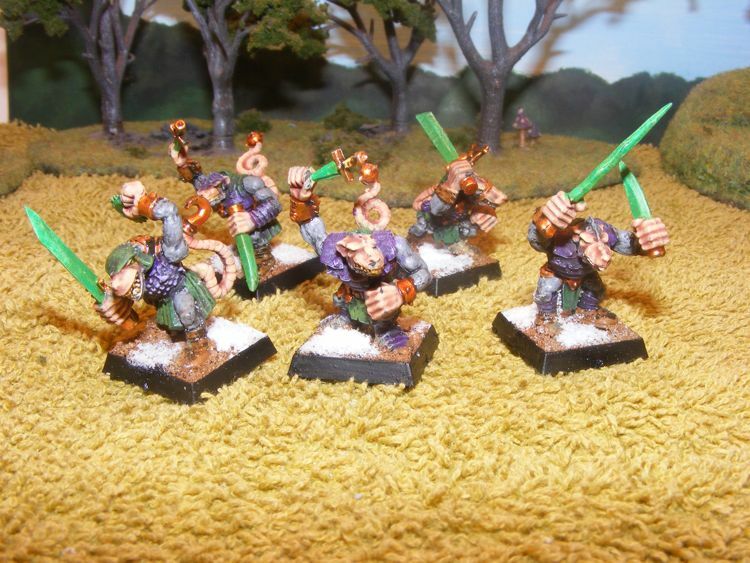 I've also painted up another eight clan rats for the hand weapon and shield unit. And I've built the Doomflayer. Again, if I hadn't left the camera at work on Friday, this'd've been a MFH ishoo. As it is, you can enjoy the photos and explanations, even if it's not step by step. 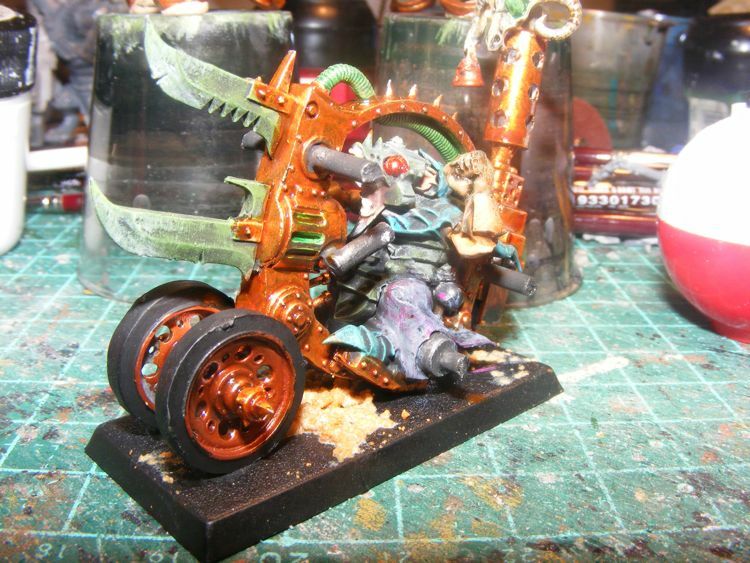 The core of the Doom Flayer is the doom wheel's engineer and inner ring. 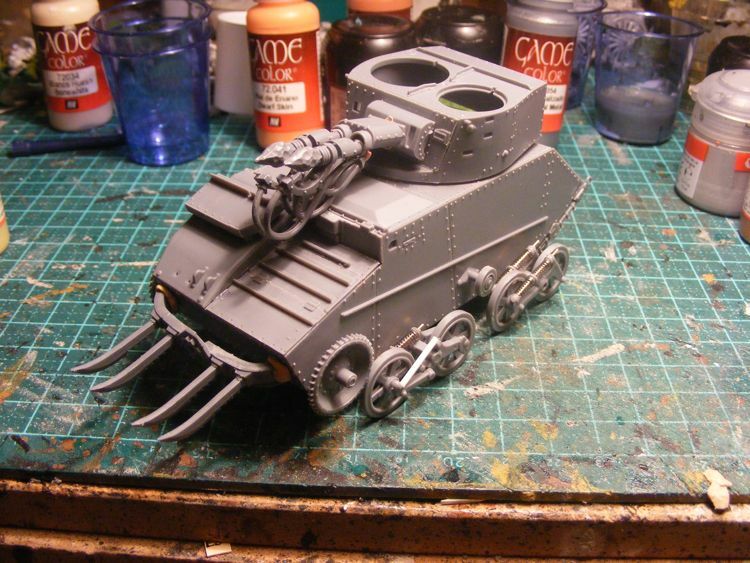 The outer ring has been removed, an engine built from an Imperial Guard heavy flamer (I think), front wheels from a tank kit, and halbard blades fitted. The outer shells are fishing bobber halves, with most of the insides dremelled to oblivion. Spikes etc. 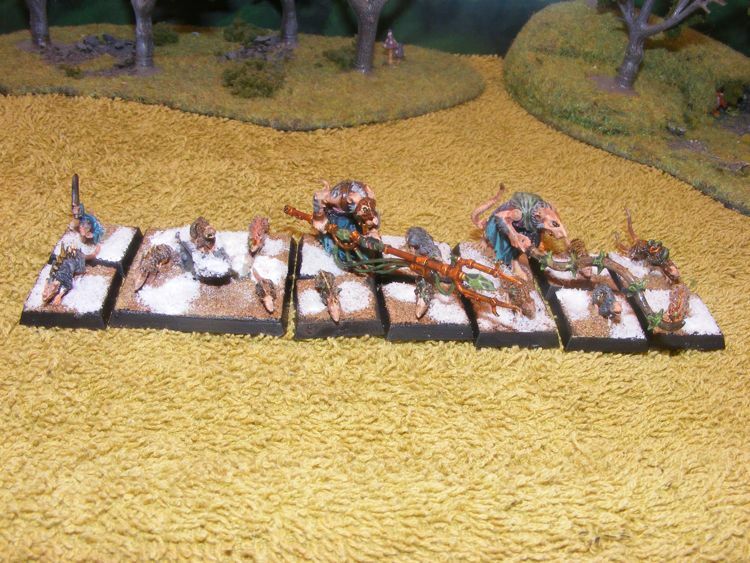 are mostly from Marauder flails or the old night runner sprues. So what does that leave me to complete? 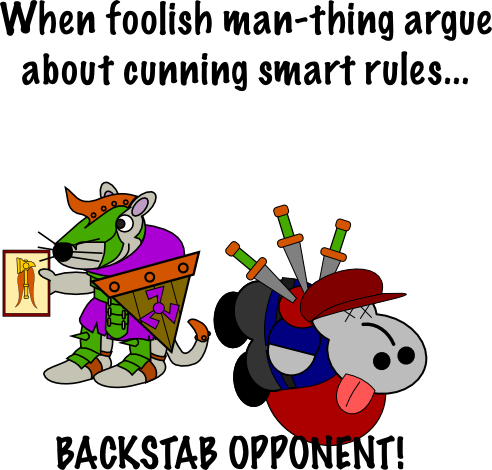 12 Clan rats, and a rat ogre. 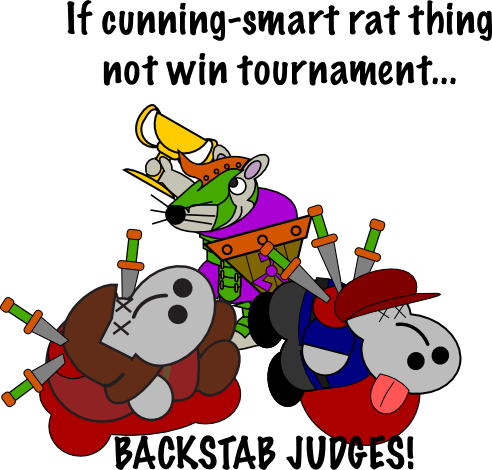 Tournaments for Cunning-Smart Rat-Things! Yes-yes! Earlier this year, I posted some helpful advice on winning tournaments. For hippos. 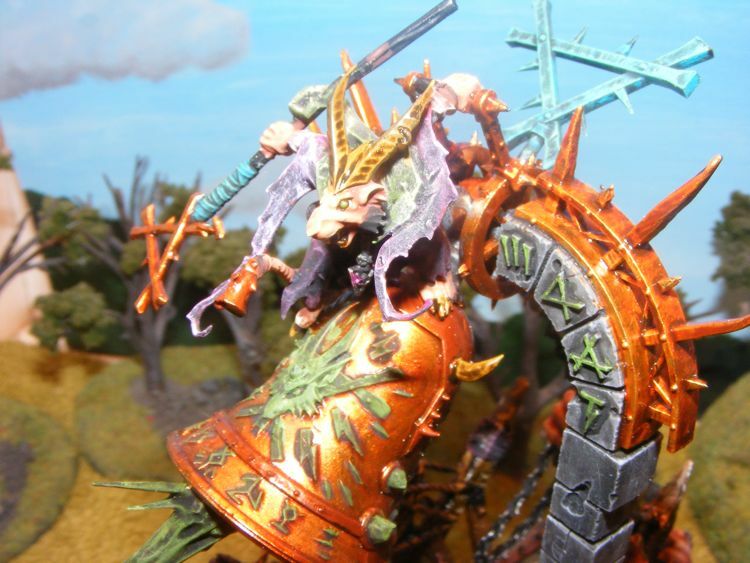 Well, since Skveek is still holding Grot hostage, and the Australian Masters' tournament is on this weekend, it's his turn to give some helpful advice on winning tournaments, the Skaven Way. Best of luck to the Hamptonites making the pilgrimage this year! Remember, don't roll like Greg. Especially if you are Greg! 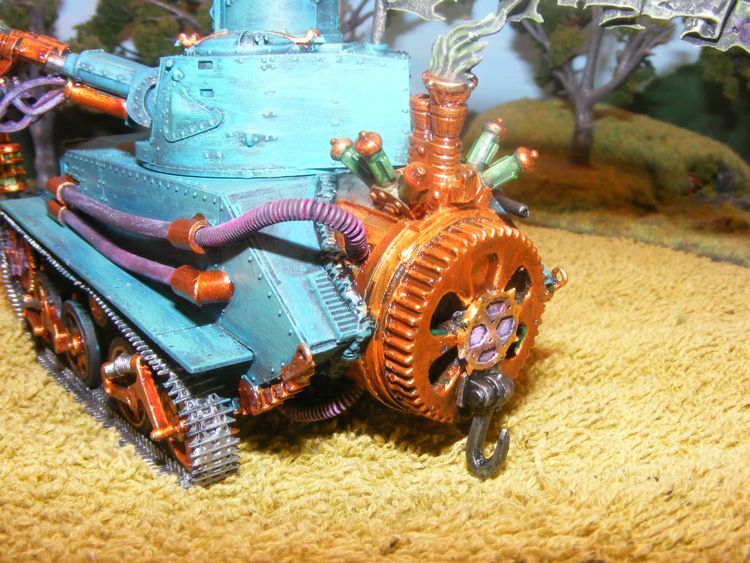 Duelling Paintbrushes 2: Day 20: The Rat Tank. Day Twenty already. Only ten days to go. 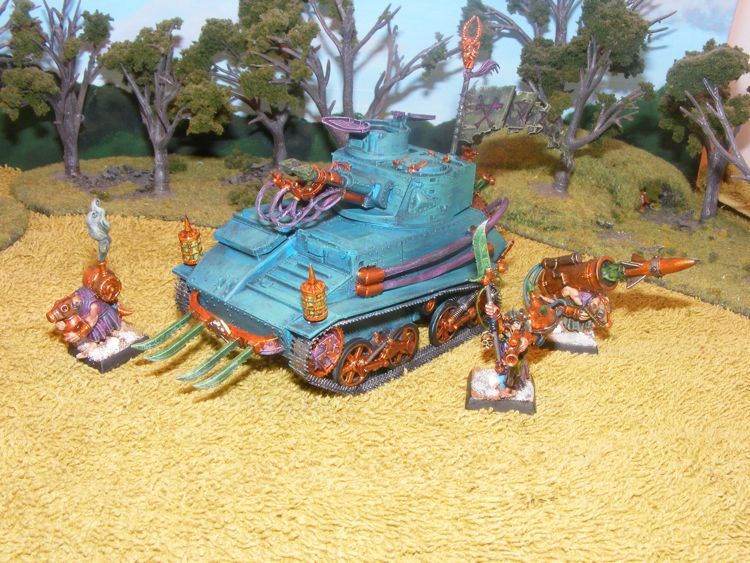 And the long awaited rat tank, for which you have waited long is here! 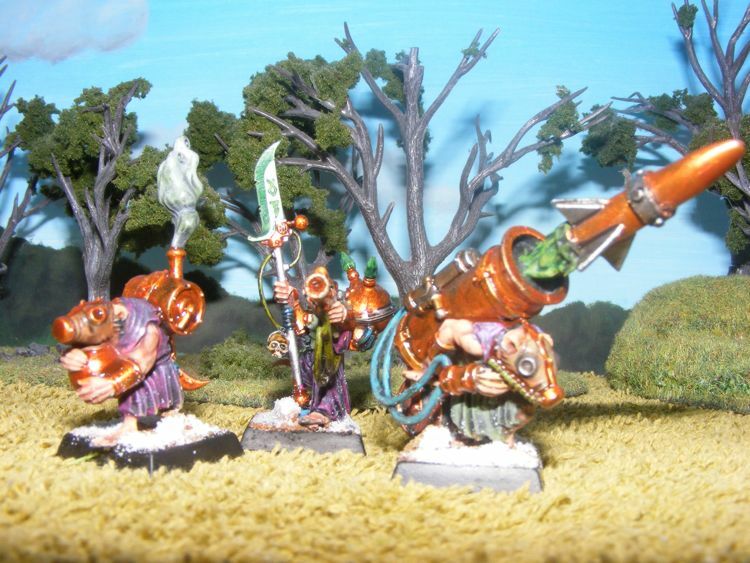 The justly proud warlock engineers of Clan Skitterklaw pose with their crazed creation. Crazily. 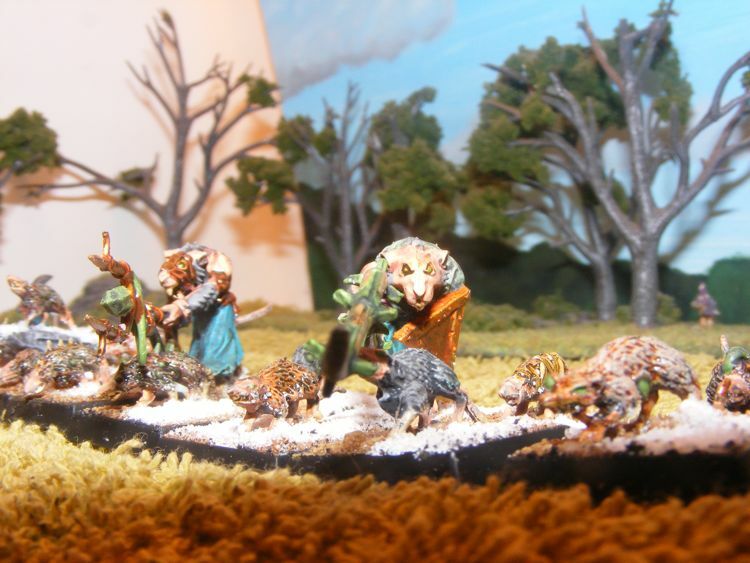 Even the loathsome rat men and their vile kin must have headlights. 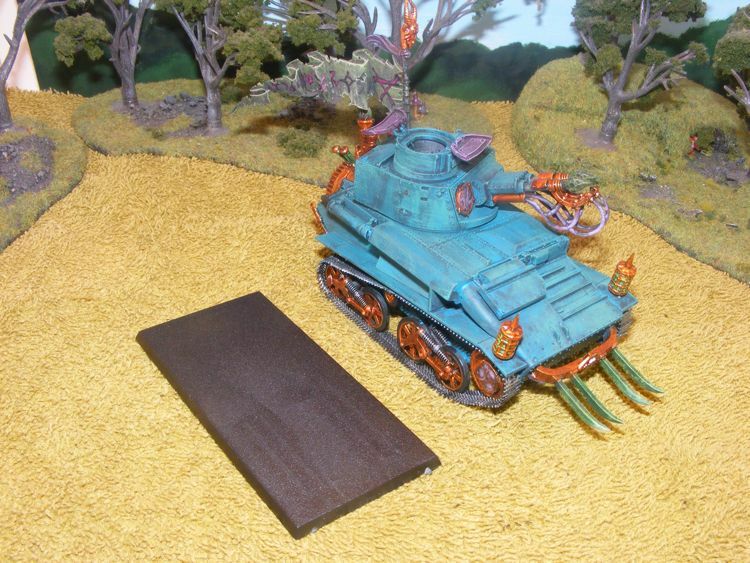 As you can see, the 1/35 Vicker Light Tank Mk. VI is almost exactly the same size as a chariot base. it's a touch wider, and the reactor makes it slightly longer, but it's not far off. Wither Clan Skitterclaw now? 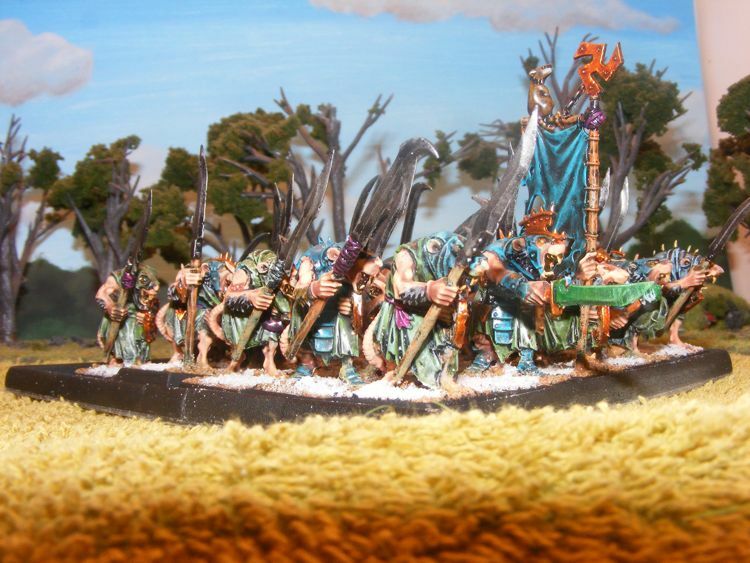 Well, yesterday I aquired some fishing bobbers for my fiendish doom flayer plans... and there's still the warplightning cannon (although current thinking calls for a large order from an online bits supplier which might delay it until after DP2 ends). And there's still the screaming bell and 20 clanrats. I might not get the WLC done due to lack of parts, but I'm sure I'll think of something to put in which takes up it's points. More rat ogres or something. Duelling Paintbrushes 2: Day 18. 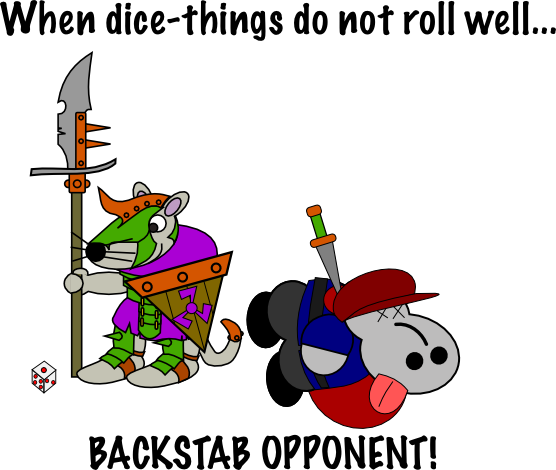 Day 18, and the giant rats are completed. 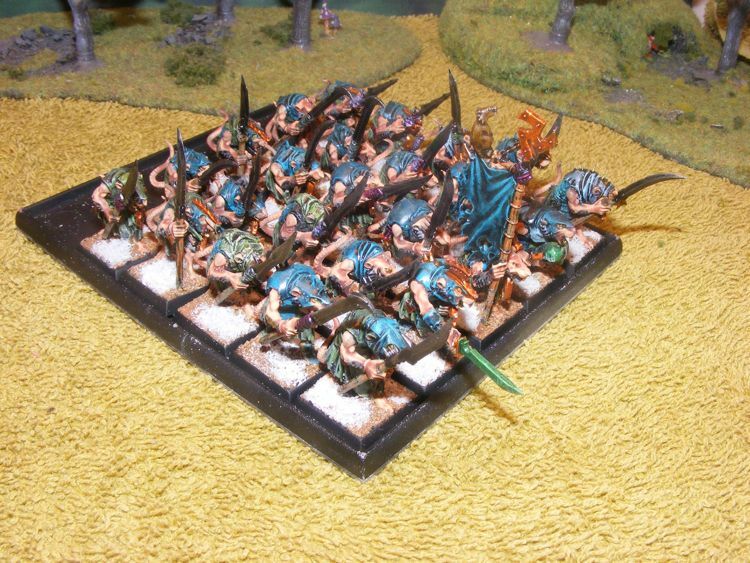 I got some plague monk rats from eBay ages ago, and combined with the lavish numbers supplied with the doom wheel, I've got a decent sized unit. 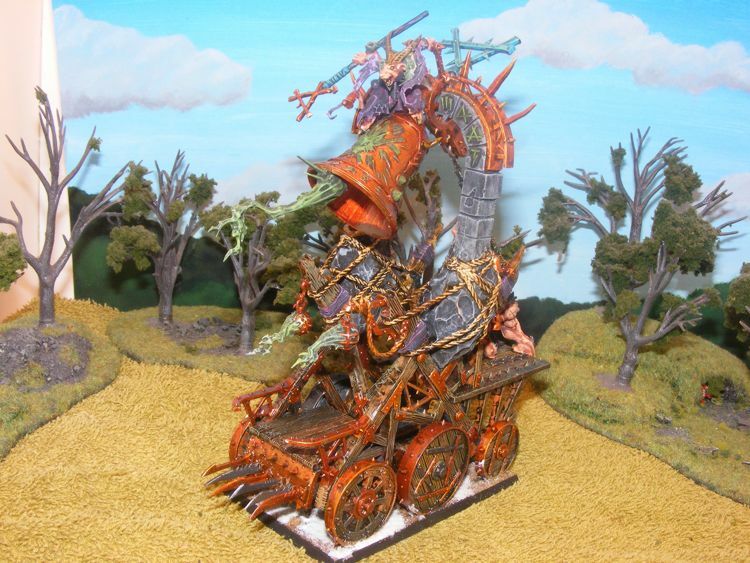 The packmasters are from Island of Blood - one is the actual pack master, the other is a clan rat with a chaos charioteer's whip. 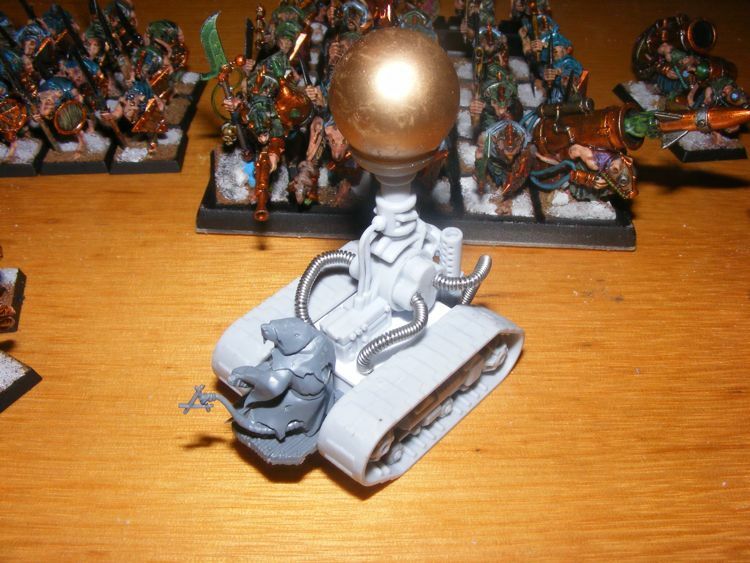 In related news, the Rat Tank is pretty close to complete now, so painting should start soon. 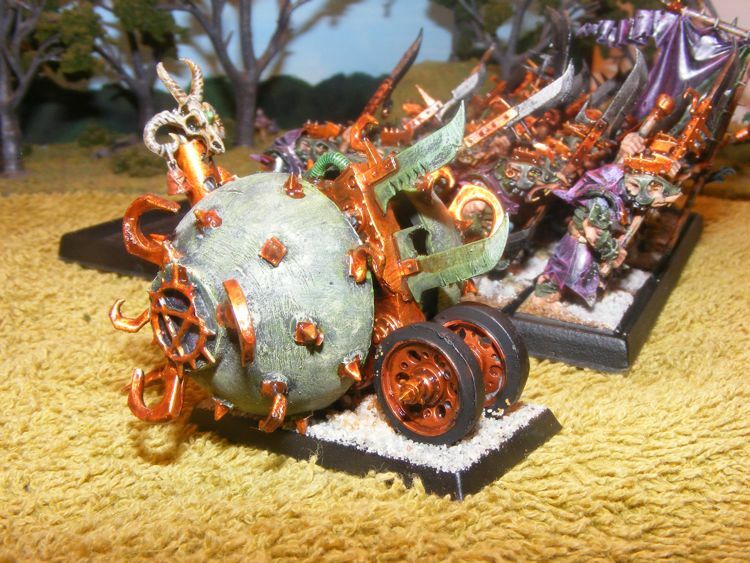 As should construction of the Warplightning Cannon and the Doomflayer. Duelling Paintbrushes 2: Day 17. Since the completion of the last regiment and the commencement of the rat tank, productivity is down. 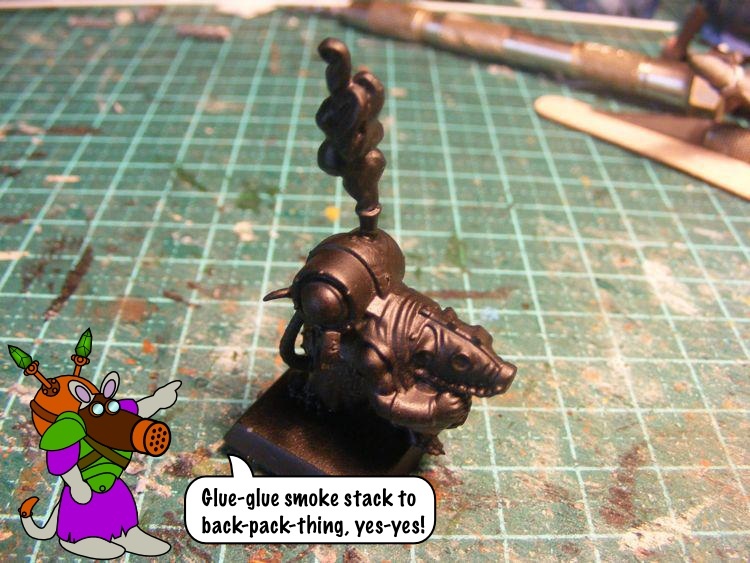 Mostly because building the rat tank is taking a while - it's a proper model kit, not a GW shake-n-bake, these things are more time consuming. However, I have now finished the warlock engineers. Can taken a really bad photo of them! 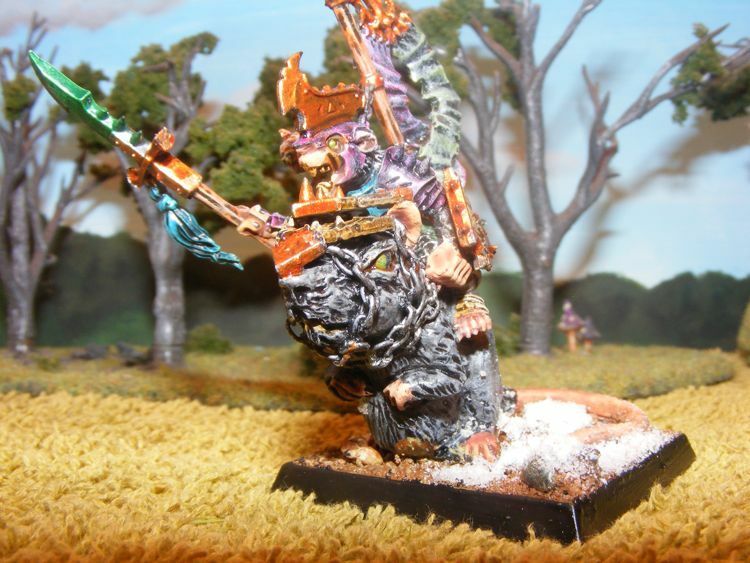 And I am considering changing the second 1000 point army list - I am a bit bored with painting clanrats, and I have run out of bases for them, so until fresh supplies arrive I am a little stuck. 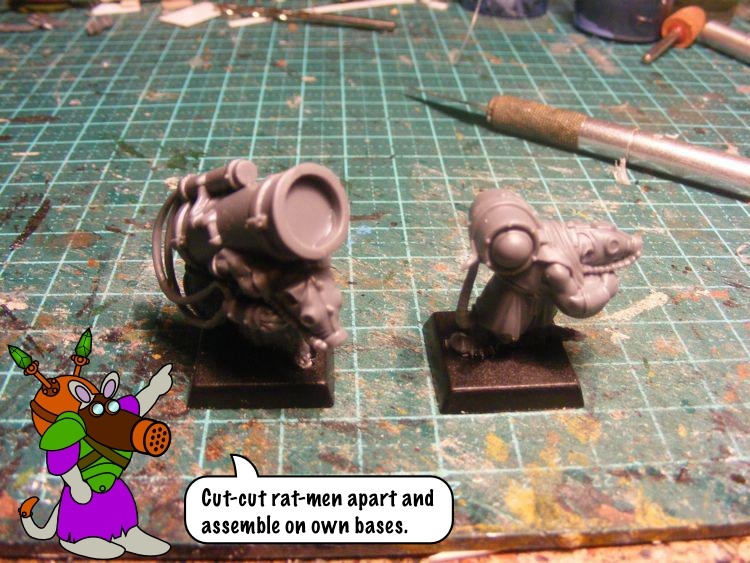 I do, however have quite a few spare rats from various sprues which could be formed into a giant rat unit, and a plan for building a warplightning cannon. 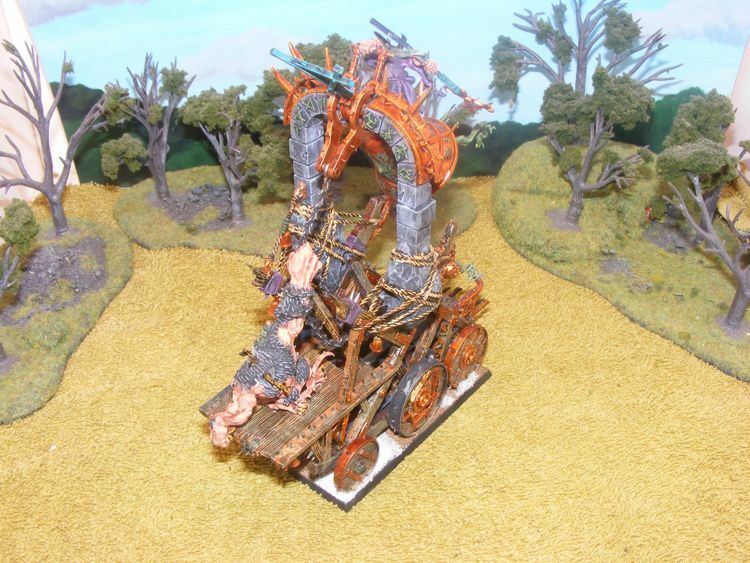 Also thoughts on building jezzails. I'll see how these fit into the list. The Island of Blood box comes with all sorts of goodness, but when you have three copies of it, you sometimes find you don't want so much of one particular flavour of goodness. 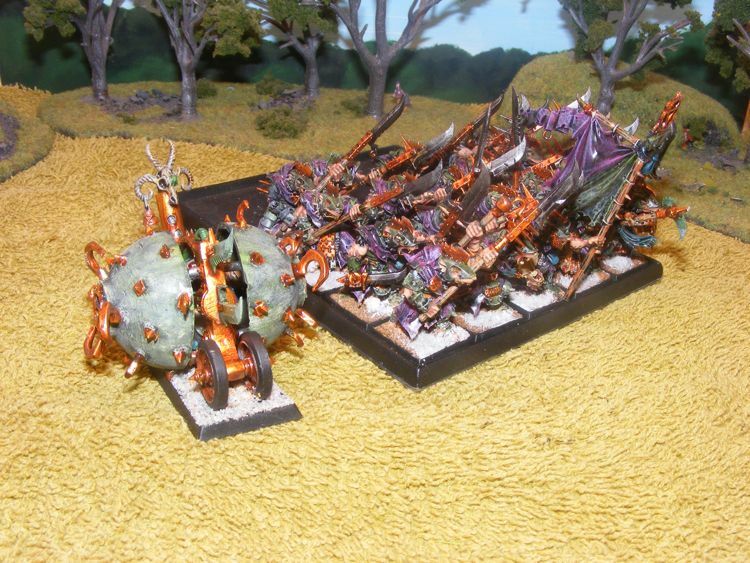 Like Plague Wind Mortars. But you do want more of another flavour of goodness. Like Warlock Engineers. 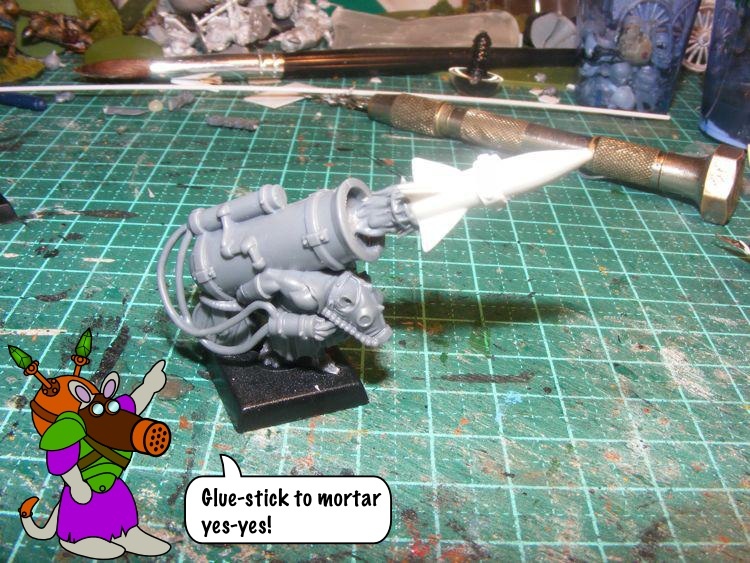 And Doom Rockets. 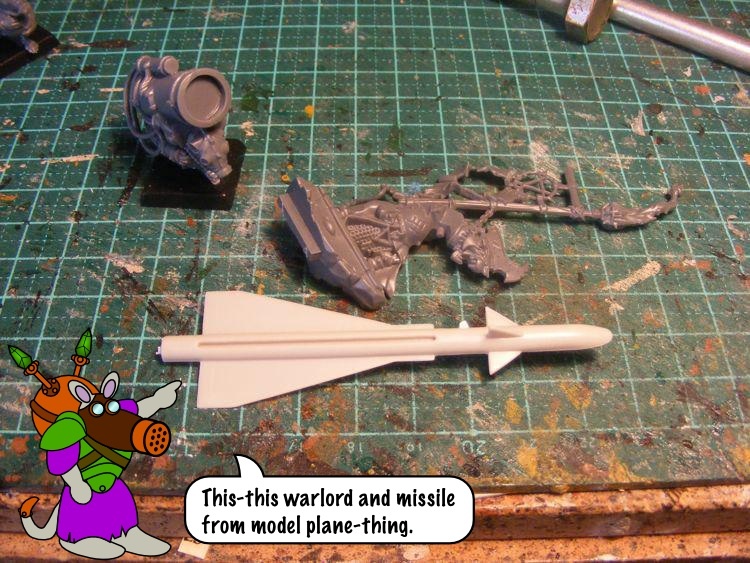 Well, it's actually pretty easy to solve this problem with the application of a little cunning (the Skaven modeller's weapon of choice!). Note: Forgot to take the photo until after the undercoat was on! Curses! 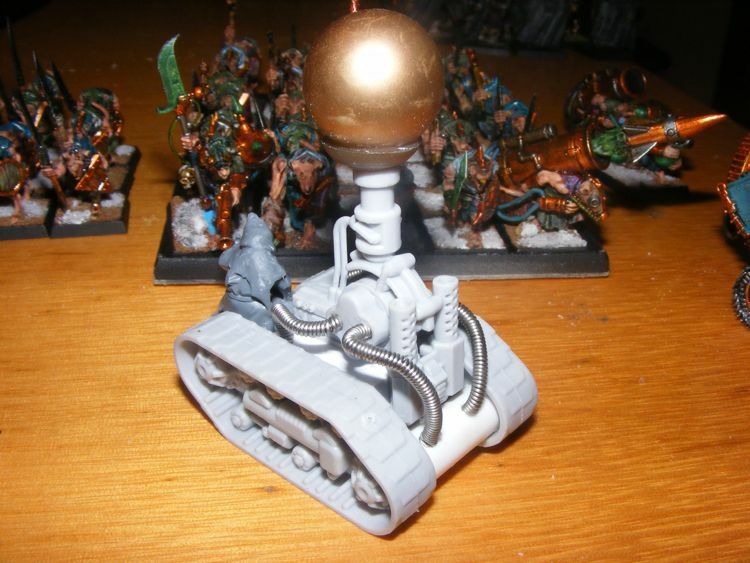 Anyway, this is my Warlock Engineer with Brass Orb. Which is much bigger than you imagined. And there you have it! Two spiffing warlock engineers with the mightiest and most interesting (and therefore not available from GW) weapons of Clan Skryer! If you're looking for a nice alternative to a Zhengdefu(ARG!) 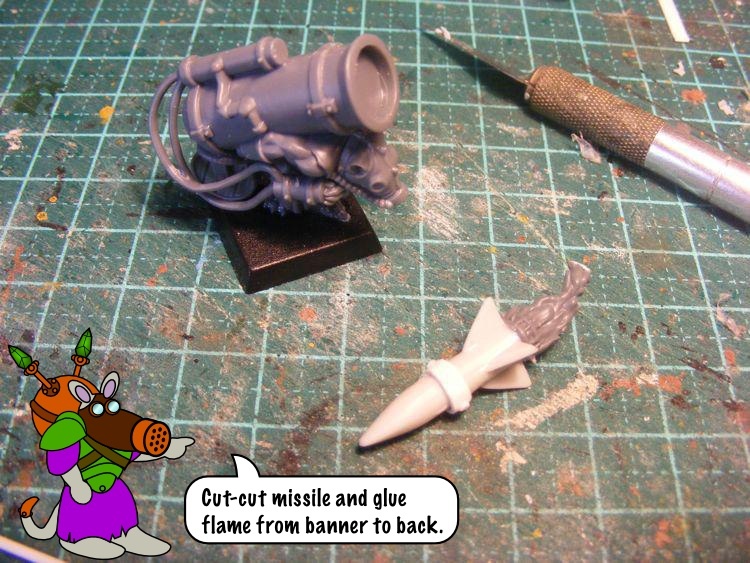 MiG 25 missile and a flame pot for the doom rocket, check out the Armorcast Cinematic Effects range - they've got some very nice missiles trailing flame which would work perfectly. 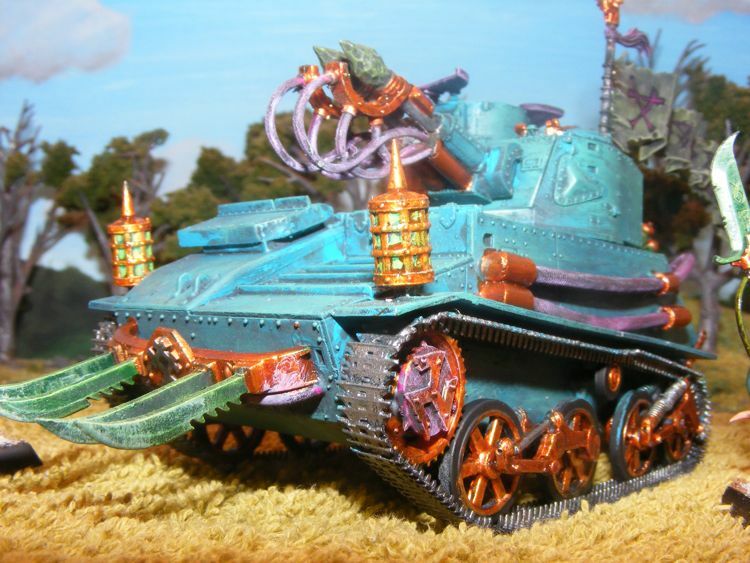 Clan Skitterklaw - all 1000 points of it. He's also painted and based from the other side. Amazing! 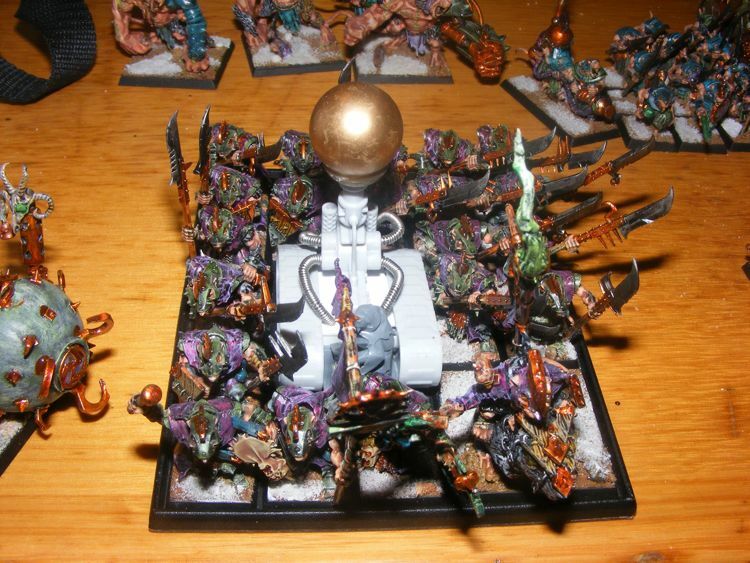 Next time you here someone bitching about how long it takes to get an army table ready, point them this way, eh? They run in gutters, and go squeak. 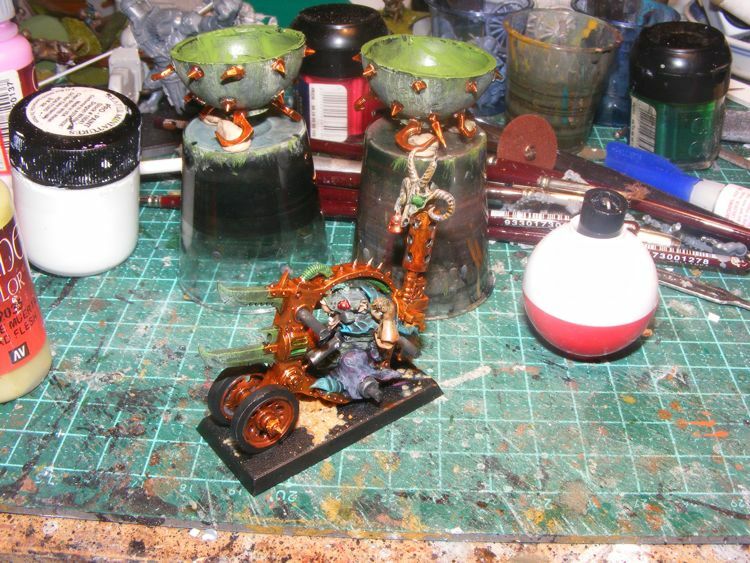 And of course, the Rat Tank/Doom Wheel has been started. The Vulcan kit is an odd combination of simple and fiddly. Some parts are very simple, but others are annoyingly fiddly. If I was making this as a model, that'd be awesome, but as a wargames piece, it can grate a bit. The springs for the suspension especially. Each one has a single brass wire, four tiny coil springs of two sizes, and two plastic flange-y-things. I got sick of all the springs and built them with just the two outer springs rather than the two inner smaller ones with the bigger ones outside them. 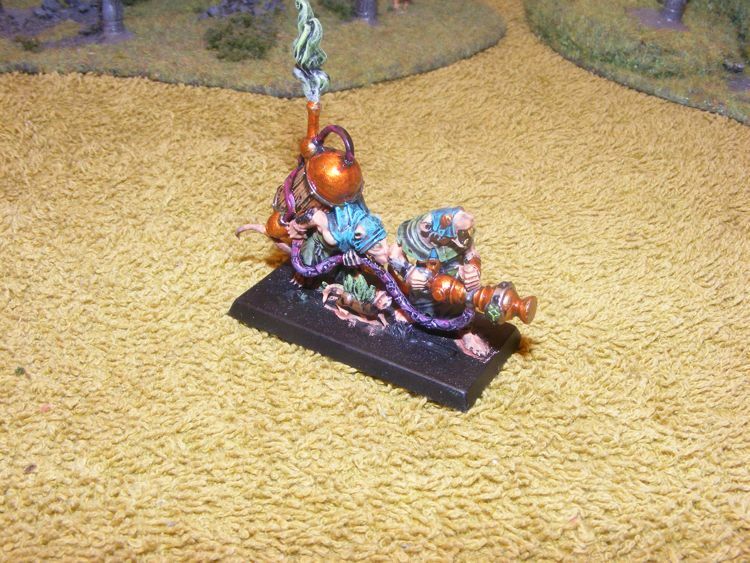 I also lost a brass wire, and some springs, so one suspension arm is typical skaven bodge work. Okay, possable suspension is pretty cool, but the tank model is not heavy enough to actually activate the stuff, and it sits wonky anyway. Sigh. Duelling Paintbrushes 2: Day Twelve. 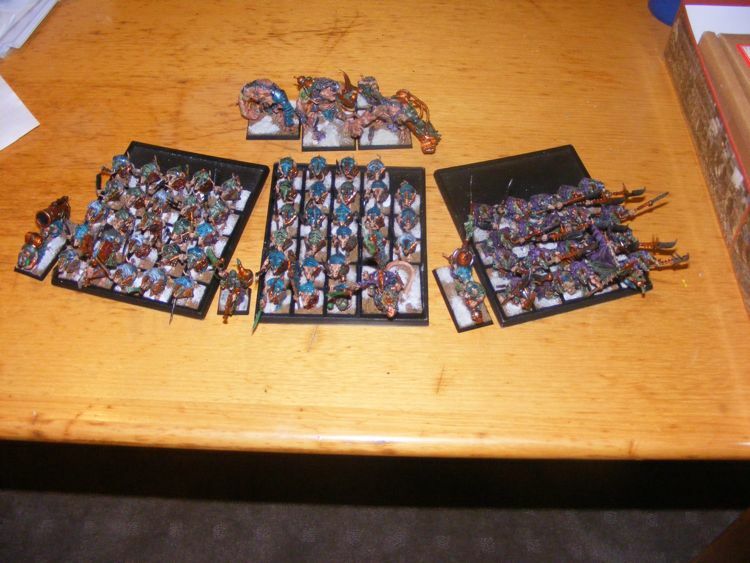 Here we are on day twelve, and my 1000 points is complete, apart from the basing on one weapon team and my warlord. So, a day ahead of my insanely over ambitious schedule, and I could be even further ahead if I'd spent more of cup day painting. Hell, I could actually increase my output on a normal day without much effort. 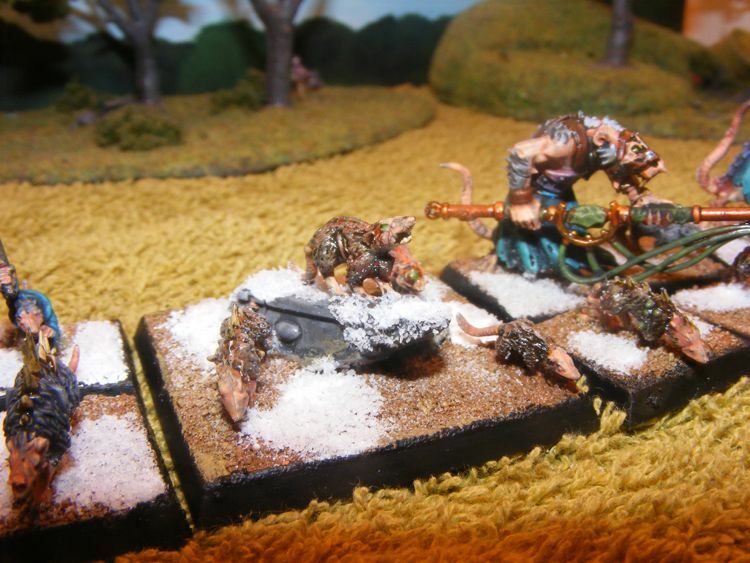 The second clan rat unit. Victim's eye view. 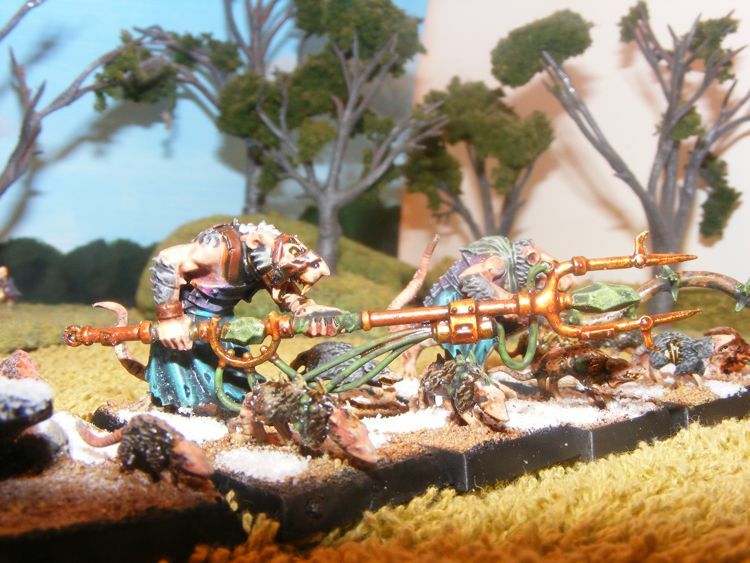 More of the second clan rat unit. 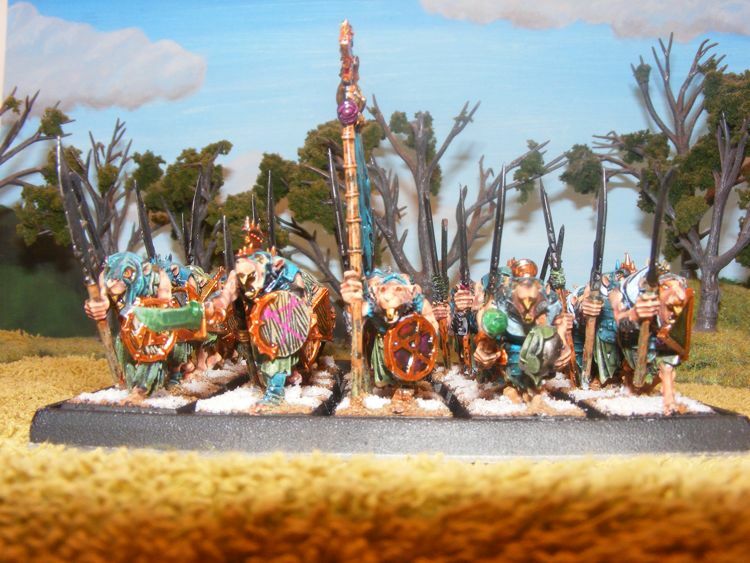 This one has the colourscheme from the first unit inverted - turquoise armour and green cloth. 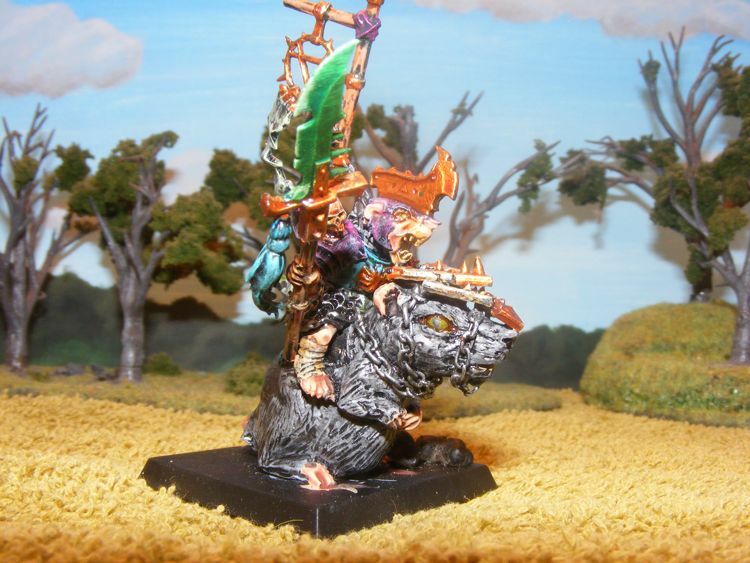 The part you've been waiting for - Warlord Skveek Skitterklaw on Great Pox Rat. The same, a different view. I was a touch worried about the rat being too cute, but he seems to be holding up his end of the bargain fairly well. 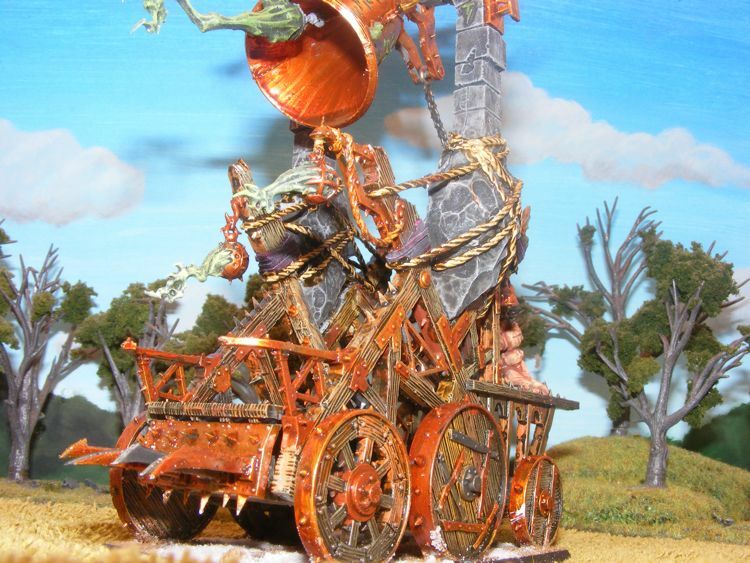 Behold the mighty flaming banner pole of Clan Skitterklaw! 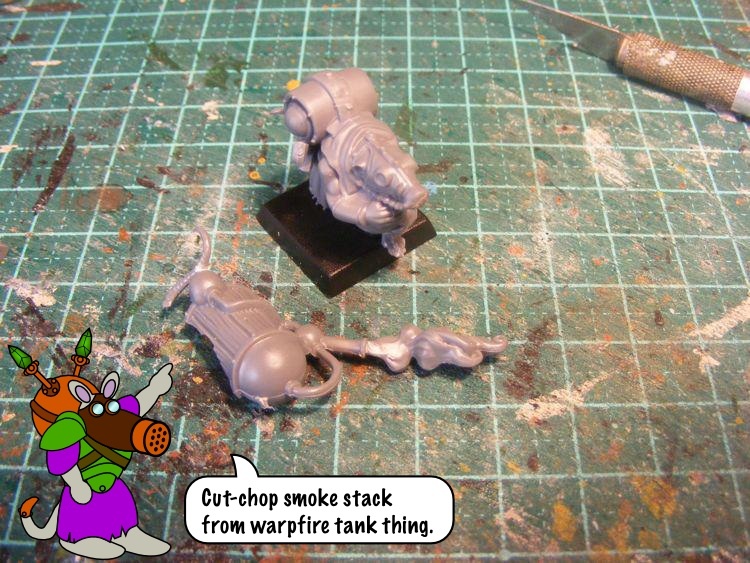 So, once the warlord and weapon team are based tomorrow, what next for Clan Skitterklaw? Well, I've finished my 1000 points Duelling Paintbrushes Force (and am therefore declared the victor, along with everyone else who finishes! ), time for the 1000 point expansion force. I've worked out a list for this. 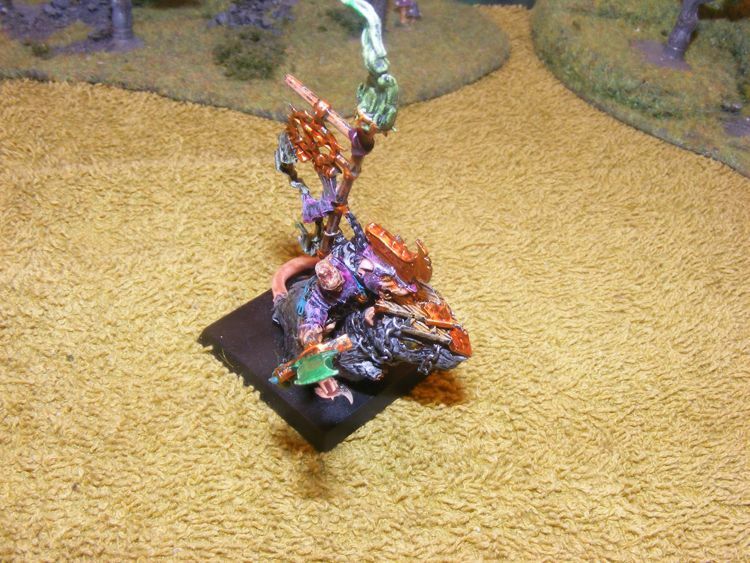 There are fewer figures because there's a screaming bell (yes I know I cannot afford a screaming bell AND lord on pox rat but the conversion was too cool to leave out). 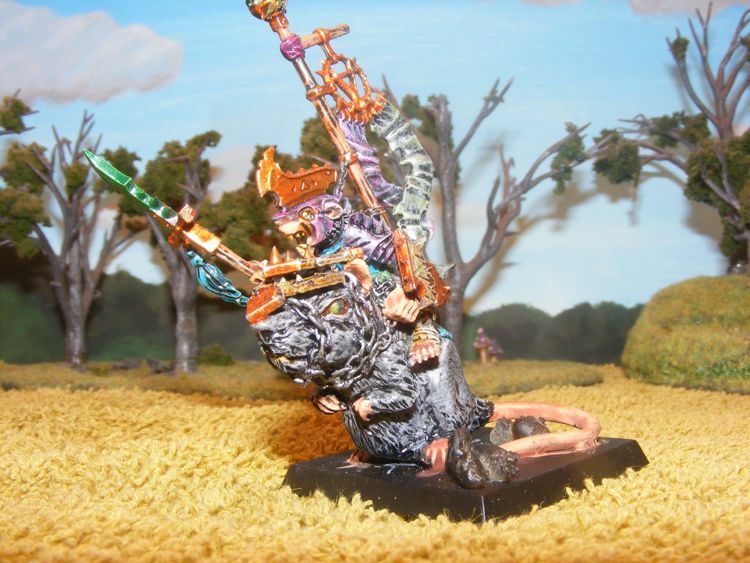 The bulk of the figures are expansions on the two clan rat units, then some exciting things and warlock engineer conversions. 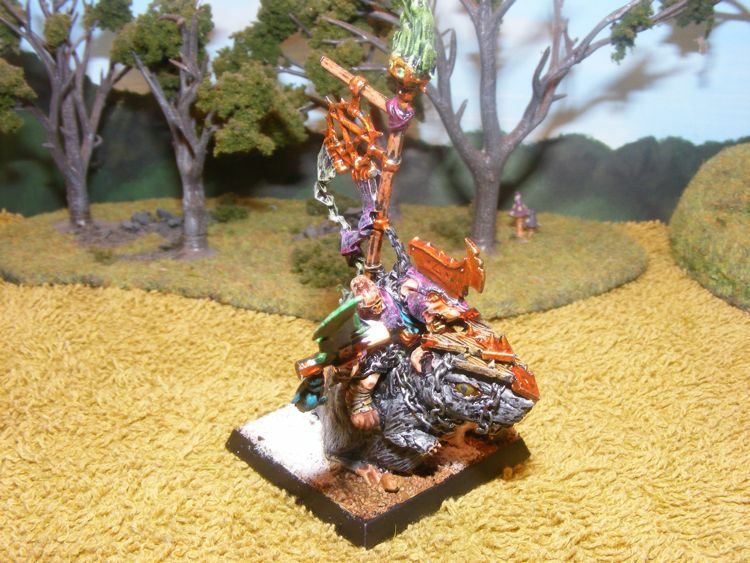 I've just been thinking about jezzails today and how to convert them from spares instead of paying GW's insane prices. I think I have it figured out, but they will not fit in the 1000 point expansion. Of course, my time estimate on getting the expansion painted is about ten days, so I'll probably have time for them at the end of the month. 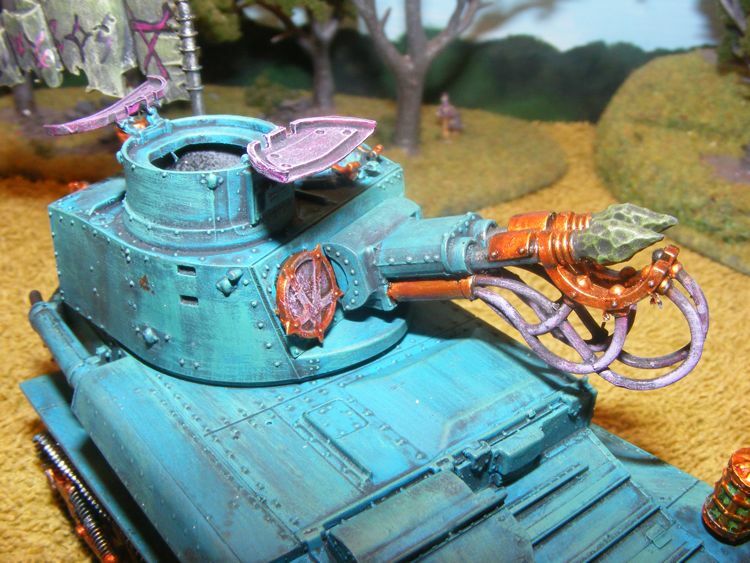 Watch out tomorrow for shots of the whole army, and updates on the Rat Tank! Duelling Paintbrushes 2 Day 8. Duelling Paintbrushes 2: Day Three. Duelling Paintbrushes 2: The Duellists.